Embellish the swimsuits with double-sided Treasure Tape™and clear Beadlets—they’ll glisten like real, wet suits! To print these instructions, click on the link above "Printable version" and then print the page out using your web browser. 1. Cut yellow and aqua cardstock 1/4” larger than your photos. Mount photosin the center using scraps of Treasure Tape™. 2. Cut one more piece of yellow cardstock, plus the purple and blue cardstock,1/4” larger than the photo/cards you just made. Mount your photo/cards inthe center of these. 3. 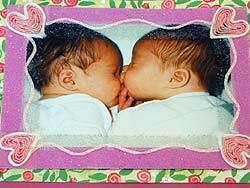 Lay 1/4-inch Treasure Tape around the border of each photo, overlappingonto the inner cardstock. Remove the red liner to expose top sticky part. 4. 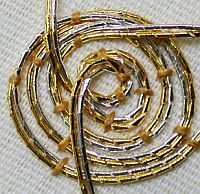 Lay Kreinik 1/16” Ribbon and Tapestry Braid in swirl patterns on thistape. Use our photo as a guide, or create your own designs. 5. 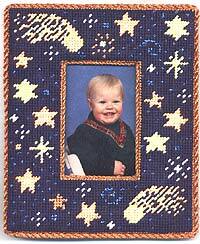 Lay each photo in the pan and cover remaining sticky areas with DiamondBeadlets. 6. 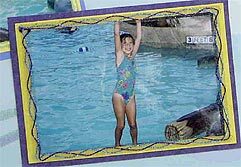 Lay tracing paper or plastic over each photo and trace bathing suits.Cut out. Lay this template on the sheets of Treasure Tape™ and cut out thebathing suit shapes following your template. 7. Remove white backing from the tape shapes, and lay on each photo, coveringthe bathing suits. 8. Remove red liner to expose sticky part, lay photos in your pan and coverwith Diamond Beadlets. 9. Mount photos on background paper as desired, adding date and captions. Option: we laid Treasure Tape on the swirls of the background paper, removedthe tape’s red liner, and covered with Diamond Beadlets. © Copyright 2005 Kreinik. Consumer Information: 1-800-537-2166 or emailinformation@kreinik.com.